One of the central themes in Neil Swideys book, The Assist, is that while talented inner-city students can often reach great heights, there is usually not much of a safety net for them when things dont go as planned. Inspired by the stories in the book, the new Alray Taylor Second Chance Scholarship Fund is designed to help promising Boston students who left college get back on track and graduate. It is named in memory of Alray Taylor, a former Charlestown basketball star and college scholarship athlete who was killed in 2006. Click here for more info or go to theassist.net. 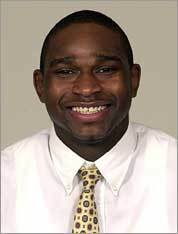 Former Charlestown basketball star Alray Taylor, after whom the scholarship has been named.